Gur hasidic sect bans popular cell phone app, rules biblical injunction to honor one's father and mother not applicable to internet users. 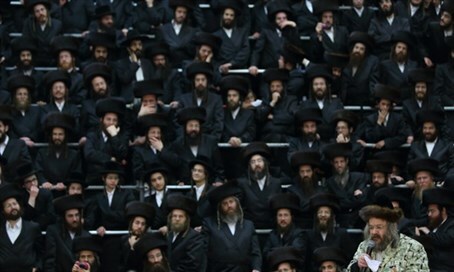 Thousands of Gur Hasidim gathered on Tuesday at convention in Jerusalem to discuss a series of new regulations regarding cellular phone applications and internet use. At the “Emergency Meeting Against the Dangers of Technology”, Hasidim were reminded of the strict prohibition against using internet-capable cellular devices, even if content screening programs are in place. According to the regulation, only those who require internet access for business purposes are permitted to use even filtered internet connections. In addition, those permitted to carry such devices are forbidden from taking them out in synagogues or in predominantly haredi areas. The popular Whatsapp cell phone application was also dealt with during the meeting. Speakers lambasted the application and called upon Gur Hasidim to remove it from their phones. Even in cases where the application is needed for business purposes, the new regulations prohibit its usage except in communications with secular Jews or non-Jews, and only where absolutely necessary. One speaker at the convention issued an unprecedented ruling against internet usage, saying that anyone who uses unfiltered internet connections is no longer deemed worthy of respect from their children.